5. Prepare the land for whats next. All the three of these are now scarce in the affected regions as the entire district is affected and there is nothing left to take solace in. Once the land is cleared off, then they have to buy seeds and saplings to proceed with the cultivation. This is my village where I spent all my summers and the only two things the people are known for are their hard work and their hospitality. I want to help them in any way possible but I realize that I will not be able to do it alone. Being the self made people they are, they are reluctant in being at the receiving end. But the truth is rebuilding takes more than just hard work. Hence I appeal to everyone to donate whatever you can to help me help my family rebuild. One restored farm creates livelihood and employment for many families. I am running this campaign to help the four families that are in my hamlet. 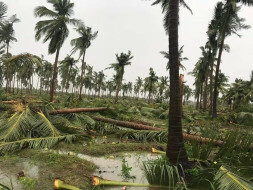 There are approximately 1200 coconut trees that are destroyed. Clearing the farm lands by cutting and disposing off the trees would alone come to around 500000 INR. Replacing this at the cost of 600 INR per sapling will require 720000 INR. Estimated cost of repairing farm equipment, construction of damaged houses for the workers in the farm, buying seeds for the fields that are destroyed will approximate to another 380000 INR at the least. While this money will not compensate entirely for all that they have lost, this will at least help them get started and most of all lead them to believe in the goodness of the world! Thank you for your support. The lands are partially cleaned with the initially withdrawn money and we are placing orders for coconut saplings. Will keep you posted on the progress. The cleaning of the residues of the cyclone is still in progress. Trees are getting cut and cleared off which is proving to be a humongous and time consuming task. The land is still not prepared for plantation. The families are currently focusing on clearing of the debris to make a decision on what to be planted next. The families are still figuring out ways to do damage control. They are yet receive any relief for the lost trees from the Government. They are slowly clearing of the fields. It is very expensive at this moment to clear all debris as the fallen trees have to be first cut, then disposed off, the roots need to be unearthed and the field has to be leveled. Since this is expensive, time consuming and laborious, the families are slowly doing one area at time. 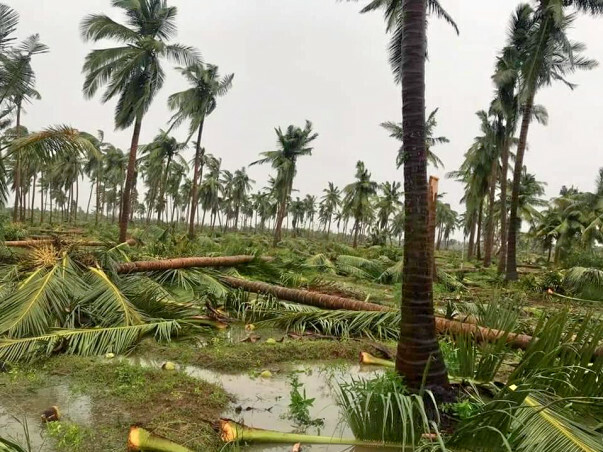 The money from the campaign will be used to pay for clearing the fields and place orders for coconut and other saplings that they can plant next to start farming. The road to recovery is slow but with all your support, it isn't impossible. Thanks to all of you for your generous support. Do share the campaign with your friends who might be willing to donate.